Missing Link is generally said to be a Munich band. This is right in that the six people forming the band met there in 1971. Bassist Dave Schratzenstaller comes from Munich. Most of the others, however, moved there from other parts of Germany: On drums Holger Brandt (from Bad Salzdetfurth near Hiidesheim), Gunther Latuschik playing the saxophone, Markus Sing on guitar, the singer Gabriel Dominik Mueller, and Dieter Miekautsch on keyboards. At that time, Munich was something like a stronghold of psychedelic and progressive music in Germany, with groups like Amon Diiul, Embryo, Popol Vuh, Out of Focus, Sub, Siloah, Between, Niagara, Subject Esq., Sameti, Sunbirds, Yggdrasil, Pentagon, and Anima. 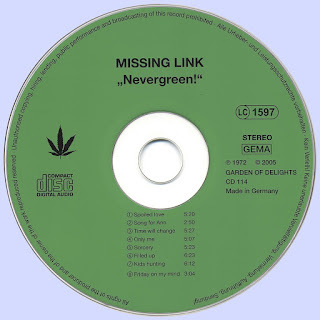 Missing Link should follow the same direction. They proved especially convincing on stage, where they were discovered by Gerhard Augustin. He was looking for talented young people for United Artists and at that time also managed the group Amon Duiil II. Gerhard Augustin provided them with a contract for three LPs, and in the autumn of 1972 they started work in the studio of Dieter Dierks in Stommein (Rhineland), well known for the many recordings for the Pilz and Ohr labels. The band was pleased to find there was a Mellotron in the studio which they could use for their recordings. Seven of the songs recorded there - all written by themselves - were released on the LP "Nevergreen!" (United Artists UAS 29439 I) at the end of the year. The title was meant to constitute an opposition to the commercial evergreen, to the level of which they wouldn't descend. The picture on the fold-out cover was designed by Holger Brandt. It should, in a mocking kind of way, represent the missing link in the evolution from ape to man. Inside, the cover shows (from left to right) Markus Sing, Holger Brandt, Gunther Latuschik, Gabriel Dominik Mueller, Dieter Miekautsch, and Dave Schratzenstaller, shot in the environs of Munich. According to Gerhard Augustin, 2000 copies of this LP have been pressed. A short while later, at the beginning of 1973, the 7" single "Friday on my mind'V'Kids hunting" (United Artists 35568) was released. The song on its flip side was already on the LP, the one on the front side a very unconventional new version of the wonderful Easybeats hit from 1966. The picture on the sleeve is based on a photograph taken at the same session as that one on the inner sides of the LP's fold-out cover. Here, however, Dieter Miekautsch is missing. He probably stood too far off. The wrong spelling of "Kids" (Kid's) on the sleeve and on the label - apostrophised - is due to an unsuspecting graphic designer who did not know the text. This time, only 1000 copies were pressed, if at all. None of the songs were bad, although they perhaps slightly lacked the fire of the band's live performances. A second and third LP could not be recorded, because at that time the label went into a financial inbalance. Every low-rank manager flew first class around the world and squandered money the artists could not bring in to this extent. Thus, finally the times of United Artists Germany were over. Also Missing Link were going downhill. They hardly presented pieces of their own any longer, but started to perform mainly in U.S. clubs, where they played cover versions. Most of them played in several groups at the same time. 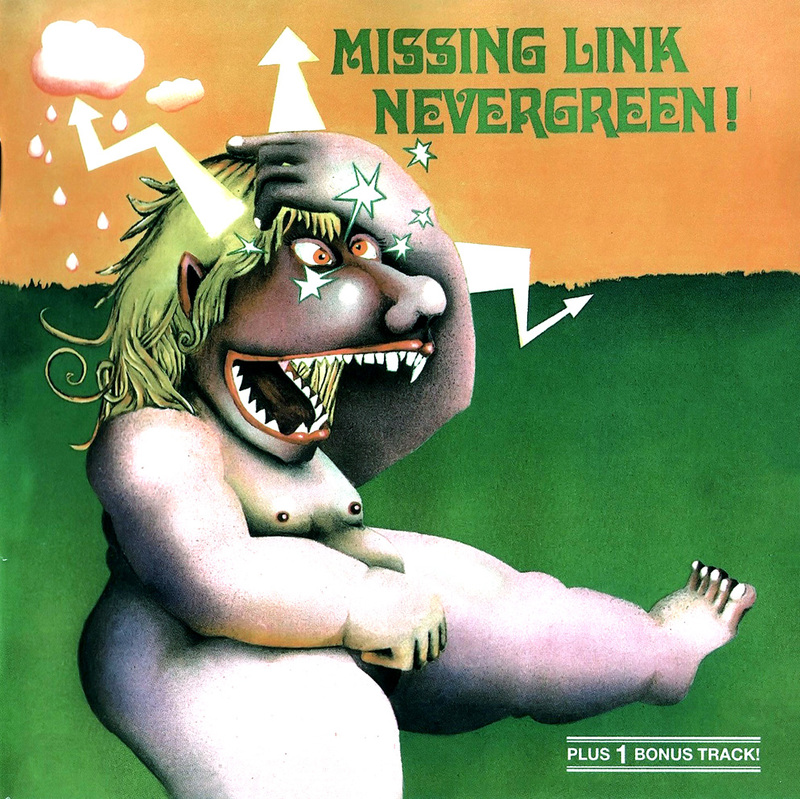 Dieter Miekautsch was replaced by Konstantin Wecker who later should become prominent as a singer/songwriter and cocaine addict, and in 1973 Missing Link finally split. In 1975, Holger Brandt - as a member of Gert Westphal and Between – released the LP "Hesse between music", and in 1976 - as a member of Sahara - the LP "For all the clowns". Today, he is a music publisher in Freising near Munich and, at the same time, plays in various bands. Dieter Miekautsch became quite well-known. He was involved in three Embryo LPs, namely "We keep on", "Bad heads & bad cats" and "Live", and in the self-titled second LP of Missus Beastly from 1974 and the Real Ax Band's one and only LP (1977). Markus Sing continued to play together with Konstantin Wecker in Wecker's backing band until he committed suicide in the early 1980s. Dave Schratzenstaller went to New York, Gabriel Dominik Mueller followed his ambition and lived as an actor in Switzerland. What has become of Gunther Latuschik is not known to any of the people involved. This release contains as a bonus song the single track "Friday on my mind", so that includes the complete work of Missing Link ever released. Many thanks to Holger Brandt, Gerhard Augustin, Holger Heimers, Jurgen Kaun, and Fuzzy for their friendly support.